Bruin Basketball Report | UCLA Bruins Basketball: Howland Wins #100, UCLA Trounces Idaho St.
Howland Wins #100, UCLA Trounces Idaho St.
Darren Collison scored a game-high 20 points and Kevin Love added 17 points and 9 rebounds to lead the Bruins to a 89-49 rout of Idaho State in front of 9,733 at Pauley Pavilion. 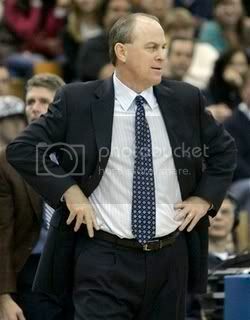 The victory was Head Coach Ben Howland 100th victory at UCLA. Howland has a career record of 100-42 in Westwood. "It means we've had some really good players the last four years," Howland said of the milestone. "I feel very blessed and fortunate. I never thought I'd be coaching at UCLA. Not many people get to say they're actually living their dream." Collison, showed he's fully recovered from his injury, shooting 8 of 11 from the field including 3 of 4 from beyond the arc. He also had 5 assists. "I really wanted to send a message because everyone was saying how rusty I was," said Collison. As expected the Bengals came out in a zone defense, however against this version, the Bruins attacked it aggressively from the outset, moving the ball around quickly from side to side and attacking into the seams of the zone off the dribble drive for easy scores. The game was never in question as UCLA raced out to a 24-7 lead just halfway through the opening half, extending the lead to as large as 21 before going into the locker room with a 38-21 lead. UCLA shot a sizzling 56.5% from the field while holding an overmatched Idaho State team to just 32.1% in the first half. Unfortunately for the Bengals, the Bruins came out in the second half with the same level of intensity and resolve to put this game away quickly as they went on a torrid 21-9 run to push the lead to 29 with ten minutes remaining in the game. From that point forward, it was only a matter of when Howland would remove his starters and insert his reserves and walk-ons. UCLA finished the game shooting 50% from the field and 42.3% on three-pointers. They also shot an amazing 16 of 17 (94.1%) from the free-throw line. Even Lorenzo Mata-Real was 2 of 2 from the charity stripe including one he banked in. The bigger and more athletic Bruins outrebounded the Bengals, 43-24, and combined for six blocks and five steals to make life miserable for their visiting opponent. UCLA made extra effort to get the ball down low to Kevin Love. He finished 6 of 11 from the field and received the ball in scoring position in multiple spots on the floor. "We were more active and got the ball into Kevin in the high post," Collison said. Josh Shipp added 16 points including four deep three-pointers as UCLA improved their record to 9-1 in non-conference play. Whether the Bruins should feel comfortable that they've solved their offensive woes against zone defenses after this game is questionable. Although the Bengals fought hard and have some quality players, their lack of size and quickness made this game resemble more a scrimmage than an actual Division I contest. UCLA next faces Western Illinois in another non-conference match-up on Tuesday. What about Matt Lee!??! No mention of his final shot at the buzzer? Matt Lee's 40 footer at the buzzer was certainly remarkable. The best part of the shot is how the team, including the starters, celebrated the basket with Matt. The walk-ons are the unsung heroes of good basketball teams. They are guys who help prepare the scholarship players throughout the season. In practices they receive the same level of instruction (and abuse) from the coaching staff. Good to see them get their due. With at least three guards coming in next year and only Mata and maybe collinson leaving, there will probably be less space on the team for walk-ons. Love is most likely gone Brad. If you think he is leaning at staying instead of leaving you are only kidding yourself. I also see Dragovic transfering. Riding the pine is not improving his draft stock. He was predicted to be a lottery pick before he arrived to Westwood. ASK, I thought the same way at the start of the season, but I now believe that all these 2-3 zones that are limiting KLove's touches, along with his being over weight and a little slow might keep him out of the NBA lottery which would probably stop him form going out after this season. If KLove loses weigtht and gets more athletic, then that could change. john wooden and kevin love are tight...i gotta think wooden is advising him to get at least one more year of education to build his character. and hes not really dominating like a top pick recruit anyways...so i think one more year would be good for his career too. kevin, if youre reading this, stay at least one more year! or else you really wont be considered a bruin...dont think youre going to be included in the group with lew alcindor, bill walton, and the other ucla greats. you wont if you leave after one year...thats just fact. I agree BruinZor...KLove is getting frustrated...He had only 4 points at the half last night...Howland talked to him at halftime...I couldn't read lips but he was probably saying stay positive. Kevin was the man the past 4 years. He comes to Westwood where he have great perimeter guys and he is not used to it. If we win the title, he is gone. If we don't, I think he will be back for a second year. Also, that game last night was horrible scheduling. Please explain that cupcake. As a season ticket holder, I left early for the first time this season. Kevins not leaving after this year. Thats my prediction. He's an intelligent guy and he'll realize he'll help his draft stock by staying. Remember, he's a power forward in the NBA not a center. Does that change any opinions out there? Looking around the country Dragovic is not Lotto. Might do well to transfer, maybe not, depends on the program. He might start elsewhere but Howlands' building a reputation for his players being NBA ready. Example: who goes higher in draft Mata or Drag? who was more highly touted coming in? There hasn't been a Howland recruit to leave for the NBA after one year or transfer (Ryan Wright wasn't a recruit of Howland). K-Love is staying. There is no urgency to feed his family...they are well off. He knows he has to work on his defensive skills to make a difference in the NBA. He is not the type of guy to be average. He wants to be mentioned with the best. I hope this is the start of getting our offensive groove against zone defenses. We need to realize that we need to run the offense through K-Love. He has the skills to realize where we have the best chance of scoring whether its through him or kicking it out. Wright was in the same class as Aboya, Luc, and Collison. He was a Howland recruit. Double R, may I ask why you would put Aboya in the starting 5 over Luc? Especially when Luc has just been playing so well recently. on another note, it's sad to say drago came to the wrong school, he's skills would be much better in a school like Zona that uses motion offense... he can be like that white european who averages double double with Zona the last few years... he should transfer... don't see him doing much in LA anyways... sad how he was predicted to be lottery before coming to LA... finally for love losing weight, maybe he should consider breaking his jaw like daniel hackett did... how is that kid getting almost a triple double... dang! Have you ever heard of Arron Afflalo on the Pistons, Jordan Farmar on the Lakers, and Ryan Hollins on the Bobcats????? Actually Luc's stock has dropped because he insists that he's can be an offensive SF. If Luc went back to the mentality of his frosh year in which he was a rebounding machine and all-hustle guy, then the NBA would regain their interest, ergo it has NOTHING to do with his offense. As for Love, he has three guys guarding him at once in the post..and daring UCLA to beat them from outside. What do you propose Howland do...force the ball inside for the sake of giving Love touches?? If Love doesn't go to the NBA this season it'll be because his athleticism is average and he plays below the rim. I think he needs at least another year to get his body into NBA shape (loss weight, increase his quickness) before he tries to go pro. Let's keep it civil everyone. Although appreciate your effort to monitor the comments, Warning: don't try to impersonate the publishers. I was wrong about Ryan Wright. I thought he was in the class before. I would have Aboya start simply b/c he brings the intensity everytime he is on the court. We have been starting too slow in the first half and playing against really good teams it's hard to catch up and win in the 2nd (i.e. Texas). Aboya does get into foul trouble a lot so I would definitely see Luc playing the starter minutes (just like what the Spurs do with Ginobli). He is rentless on the O and D Boards, setting screens, and really physical. Have him start...set the tone then rotate to Luc. I bet it would throw a lot of teams off. A lot of speculating here gang! Whoever made the comment about the NBA not looking for good defenders is dead wrong! Please give the execs more credit than that! But being the business they are, every team wants a high-scoring, flamboyant draw (Kobe, Wade, James, Arenas) to bring in the fans. It is not the NBA that doesn't appreciate D-minded players, it is all your feel-good, barely scratch the surface fans (let me go to the game to be noticed or hobnob with a celebrity). So bottom line is this, the next level is DEFINITELY keeping an eye on Howland's players because he is producing some of the best defenders in the nation at the college level. Heck, you may even see Mata-Real drafted and making an NBA team because of his aggressive "D"! Also, I say Love stays another year for sure, for precisely the same (very intelligent) comments posted here! BBR you should be VERY proud of this site. Between your great info and stimulating posts, it is B R U I N heaven in my book!!! Hey Brew In, it's a real "Love fest" here and I don't just mean Kevin. I do agree that BBR does a fantastic job and keeps our baby blue Bruin veins flowing. I am in agreement that Love will stay another year to improve his game against big, tough, polished college big men. The only way he goes is if he dominates the NCAA Tourny this year which I really don't see that happening as his defensive foot speed has only looked so-so so far, and we haven't even hit conference play. Needs another good summer with Howland and his staff. Besides, I also think he would like to be remembered in the same light as legends like Alcindor and Walton. It will take at least one more year (or even two) to be even considered.